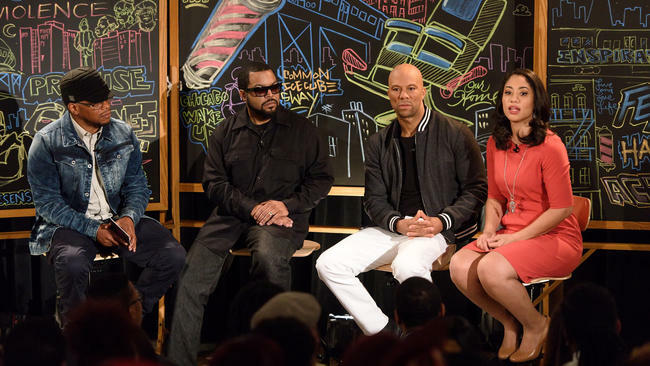 Hip Hop legend Ice Cube and Academy Award-winning artist Common have partnered up with VH-1 for Behind the Movie: Exploring Chicago with the Cast of Barbershop: The Next Cut. The event takes place at a Chicago college and premieres Monday, April 11 at 10 p.m. on the network. It features a variety of topics relevant to young people—from relationships and artistic expression to gun violence. Overall, the episode focuses on the importance of barbershops involved with community activism. The dialogue is led by Common, Ice Cube and VH-1’s Sway Calloway, along with local college students and grassroots organizers personally impacted by gun violence.